Zionist Union chairman accuses Netanyahu of surrendering to Hamas in speech at Rabin memorial. 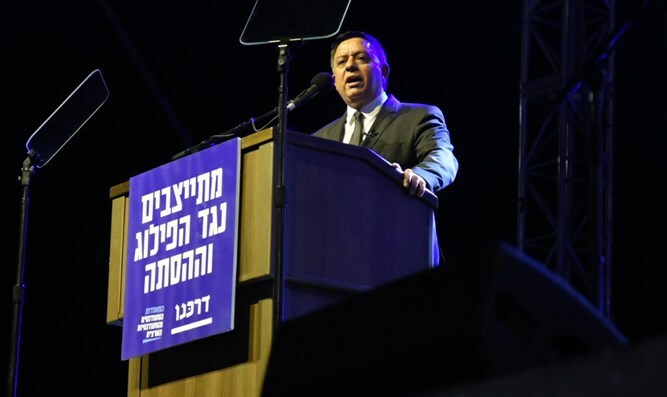 Zionist Union chairman Avi Gabbay on Saturday night accused Prime Minister Binyamin Netanyahu of surrendering to the Hamas terrorist organization. His comments were made at the memorial for assassinated Prime Minister Yitzhak Rabin which was held at the Rabin Square in Tel Aviv. “In the years since the murder, a new generation has been born and raised. A generation that did not get to know Yitzhak Rabin's Israel. Young families, students, soldiers. I want to focus on you tonight,” said Gabbay. “Your generation recognizes a different reality. With a different kind of leadership. A leadership that instead of deciding – puts off making decisions. Instead of solving problems – gets its picture taken. Instead of doing - talks. Instead of joining - separates. A leadership that has nothing to do with our real lives,” charged Gabbay. “They know that Rabin chose peace and fought Hamas. Netanyahu gave up on peace and surrendered to Hamas!” Gabbay claimed. “And it is not only in security. When Rabin was prime minister, I was a young economist at the Finance Ministry. When we worked on economic plans and reforms, we knew that problems are solved and are not ignored. Rabin would not accept a situation in which 200 salaries were needed to buy an apartment. Rabin would never have closed an emergency room in Kiryat Shmona. Rabin did not find this boring! Rabin would have thought of us and would not have given his hand to the corrupt gas plan! Rabin proved that it is possible to behave differently,” continued Gabbay, in a reference to the recent incident in which Netanyahu called a heckler in Kiryat Shmona “boring”. “The residents of Beit Shemesh, Nahariya, Haifa, proved this week that it is possible to defeat the destructive force. You can beat despair! The majority in Israel wants change, and it is possible to win and achieve change. It is possible to win if we work together, we can win and unite the Jewish people. We can win and return to Rabin’s way,” concluded Gabbay.